Amerikansk. Geografi: øgruppe i Stillehavet også kaldet Johnston atollen som består af fire øer: Johnston Island, Sand Island, North (Akau) Island og East (Hikina) Island. American. Geography: Archipelago in the Pacific Ocean also known as the Johnston Atoll which consists of four islands: Johnston Island, Sand Island, North (Akau) and East (Hikina) Island. Natur og klima: Fisk. Fugle. 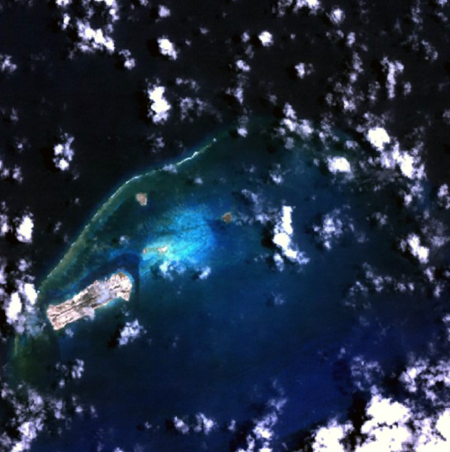 An Ecological Assessment of Johnston Atoll. / : Phillip Lobel et al. U.S. Army Chemical Materials Activity. . - 48 s.
Øerne blev annekteret af USA i 1898. Amerikansk fly- og flådebase under og efter anden verdenskrig og under den kolde krig. USA foretog i alt 12 atomvåbenforsøg på øen, herunder Operation Dominic, 1962. Øen anvendes også som et militært kemisk affaldsdepot. The islands were annexed by the United States in 1898. American air and naval base during and after World War II and during the Cold War. United States made a total of 12 nuclear weapons tests on the island, including Operation Dominic, 1962. The island is also used as a chemical weapons dump. Se også: Johnston Atoll Chemical Agent Disposal System. National Archives and Records Administration: Operation Red Hat : Men and a Mission - Department of Defense. Department of the Army. U.S. Army Materiel Command. U.S. Army Munitions Command. Edgewood Arsenal. (08/01/1962 - 1971). This film shows the movement of Okinawa - based American munitions to Johnston Island in 1971. Footage reveals that in 1962, Edgewood Arsenal was involved in a classified operation to ship munitions to Okinawa under the code name "Red Hat." In 1969, it was discovered that toxic munitions were in Okinawa and President Richard Nixon promised Japan's Prime Minister that he would remove the toxic munitions. On February 13, 1971, the first convoy of chemical weapons was sent to Johnston Island, located 750 miles southwest of Hawaii. US Department of Veterans Affairs: Information from Department of Defense (DoD) on Herbicide Tests and Storage outside of Vietnam. 2010. - 10 s.